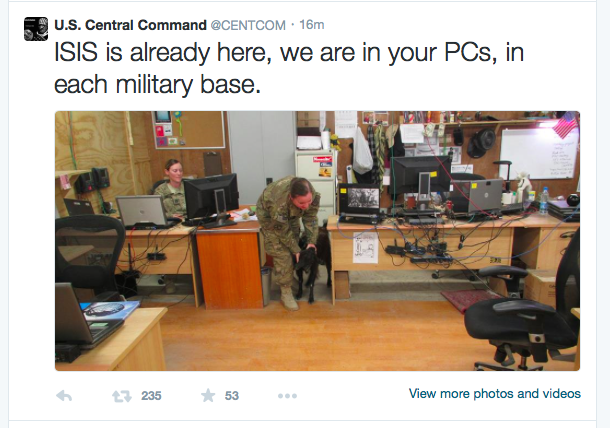 The Twitter and YouTube accounts of the United States Central Command appeared to have been hacked Monday morning by attackers claiming they are affiliated with the Islamic State in Iraq and Greater Syria, otherwise known as ISIS. 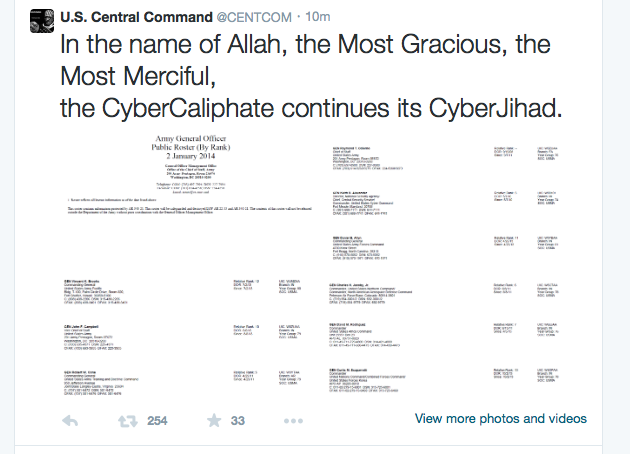 CENTCOM’s Twitter account has been suspended in wake of the hack. Hackers posted threatening messages directed at U.S. servicemen and women indicating that they have infected military computers and are keeping their eyes on army personnel and their families, but it’s unclear whether this has actually happened. 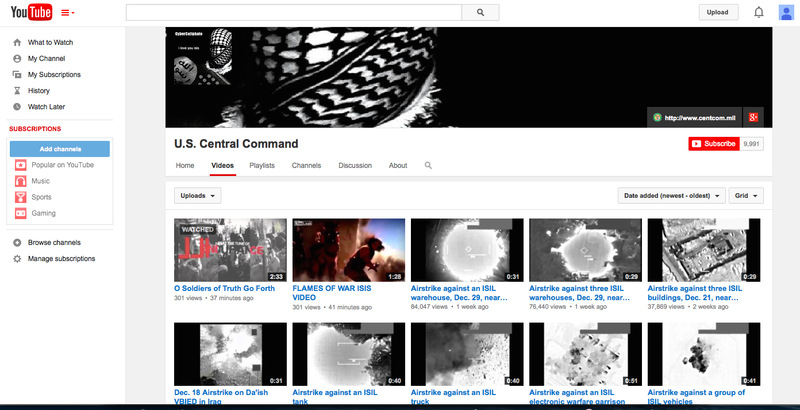 U.S. Central Command’s YouTube page seems hacked as well with the header on the page displaying the message “I love you Isis.” Two ominous videos have been posted as of 10:25 AM PST. 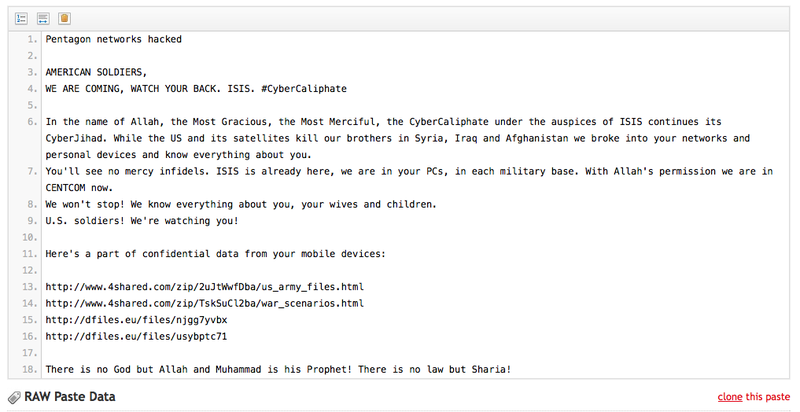 According to the BBC, “It does appear to be a serious security breach.” The next stage of terrorism is cyber warfare. We appear ill equipped for the next stage. Itâ€™s scary because Obama isn’t capable of swatting a fly let alone destroying ISIS or stopping their cyber attacks. His threats are meaningless and his presidency is that of a massive failure. I rooted for him. I am saddened by the non-stop lies and spin. I am saddened by the disaster that his Presidency has been. I wanted him to be the best President in our history, for so many reasons. Unfortunately, he has likely been our worst.